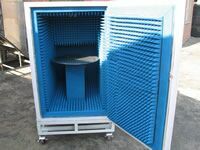 Product categories of Pyramidal Microwave Absorb Material, we are specialized manufacturers from China, Pyramidal Microwave Absorb Material, Microwave Rf Foam Absorber suppliers/factory, wholesale high-quality products of Pyramidal Absorb Material For Anechoic Chamber R & D and manufacturing, we have the perfect after-sales service and technical support. Look forward to your cooperation! JA microwave pyramidal absorber aligned light blue quadrangular pyramid, possessing good fireproof performance which fulfills American NRL Report 8093.Service temperature: -50 ℃ ~ 70 ℃ . It is of good vertical incidence . oblique incidence . scattering and isolated decay performances at the wideband range. 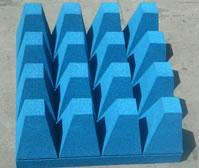 It is mainly used for subject material of anechoic chambers.